I spent the week writing the article for the Fashion Framework, Finishing with Confidence and Correspondence Course News. It feels great to have that all done. I realized I hadn't posted photos of the cats for a while. Here is my sweet little blind Petipa. She is expecting a treat. George is on his couch (typical male), plotting evil, no doubt. He loves lounging on knitwear. The orange is one of those ruffled scarves Harriet made for me. George has claimed it as his own. I received a few lesson the past two weeks. I am expecting an uptick due to the number of emails I have been getting. Fall is on its way! When you pick up stitches, there is a raw edge. This technique encases the raw edge. Here is a photo of the RS. And here is the WS. I don't use this technique all the time but it does add a certain something to special projects. For example, if I am making a baby sweater, I take the time. (Think sweater folded in a box.) It is ideal for reversible garments. This is my favorite thing to teach at conferences. Once the students have the basic concept, they use it in a variety of ways. 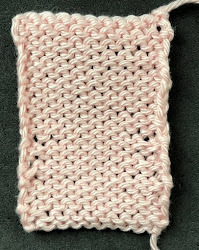 To use this technique, you need two circular needles; one the size you use for the band, the other should be at least three sizes smaller. Working the first row is a pain since you are dealing but once you have the first three stitches set up, it is easy. Here is the video: Picking Up Stitches for a Double Bands. Salon will be on Saturday (September 5) from 1:30-3:20. I've had time to try and catch up on gift knitting before I start garments for the Spring issue. These scarves are for Cynthia and Jordan. I plan to get them in the mail today. The pink one may look familiar. I did knit one several weeks ago. That scarf is gone. I donated it to a charity auction. Luckily I had enough yarn to knit it again. I really do like the Seafoam pattern. I am exactly halfway through with a double knit scarf for Martha's birthday. I made a version of this scarf several years ago. I can't say I love double knitting but it does produce a fun fabric. One more gift to go and I can start on the dress I want to knit. The yarn arrived from RedFish several weeks ago and it is haunting me! I hope you publish the cat scarf pattern. I'm not a cat person but I have lots of friends who would appreciate that thoughtful gift. It's so cute.